This is a list of Mobile Network Codes (MNC)s And Mobile Country Code (MCC)s in the United States, used by GSM and other wireless networks using the IMSI format to uniquely identify wireless subscribers indifferent of device or phone number. The MNC is the series of digits immediately following the mobile country code, or MCC & he mobile network code, or MnC. For a full list of MNC/MCC combinations worldwide. Mobile country codes (MCC) And mobile network code (MNC) are used in wireless telephone networks to identify mobile stations. The mobile country code consists of 3 decimal digits and the mobile network code consists of 2 or 3 decimal digits (for example: MNC of 001 is not the same as MNC of 01). A mobile country code (MCC) is used in combination with a mobile network code (MNC) (also known as a “MCC / MNC tuple”) to uniquely identify a mobile network operator (carrier) using the GSM (including GSM-R), UMTS, and LTE public land mobile networks. Some but not all CDMA, iDEN, and satellite mobile networks are identified with an MCC/MNC tuple as well. For WiMAX networks, a globally unique Broadband Operator ID can be derived from the MCC/MNC tuple. TETRA networks use the mobile country code from ITU-T Recommendation E.212 together with a 10-bit binary mobile network code. However, a TETRA network may be assigned an E.212 network code as well. Some network operators do not have their own radio access network at all. 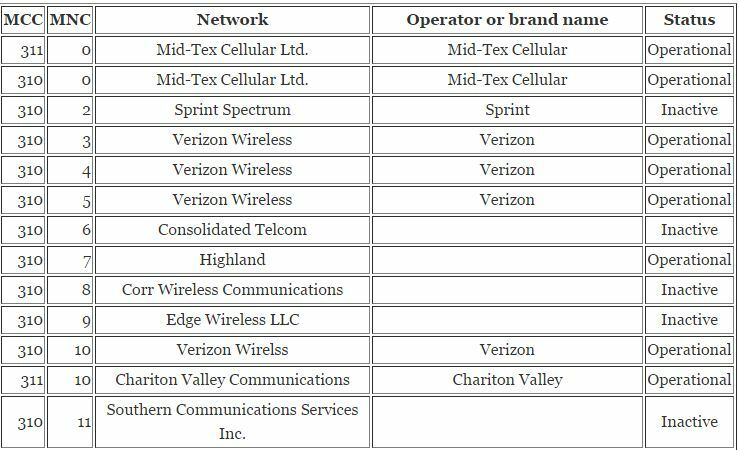 These are called mobile virtual network operators (MVNO) and are marked in the tables as such. Note that MVNOs without their own MCC/MNC (that is, they share the MCC/MNC of their host network) are not listed here.